CW3 Benton is a Senior Aviator in the U.S. Army who has accumulated 2,950 flight hours, including over 800 hours in combat. From 1993 to 1995, he attended the Korean Language course at the Defense Language Institute in Monterey, California, as well as the Tactical Interrogator Course at Fort Huachuca, Arizona. In 1995, he attended flight school at Fort Rucker, Alabama, where he also completed the OH-58D Kiowa Warrior Aircraft Qualification course. In 1997, he joined the 4/2nd Armored Cavalry Regiment at Fort Polk, Louisiana. Later, he was deployed with Task Force Sabre in Operation Joint Guard in Tuzla, Bosnia. 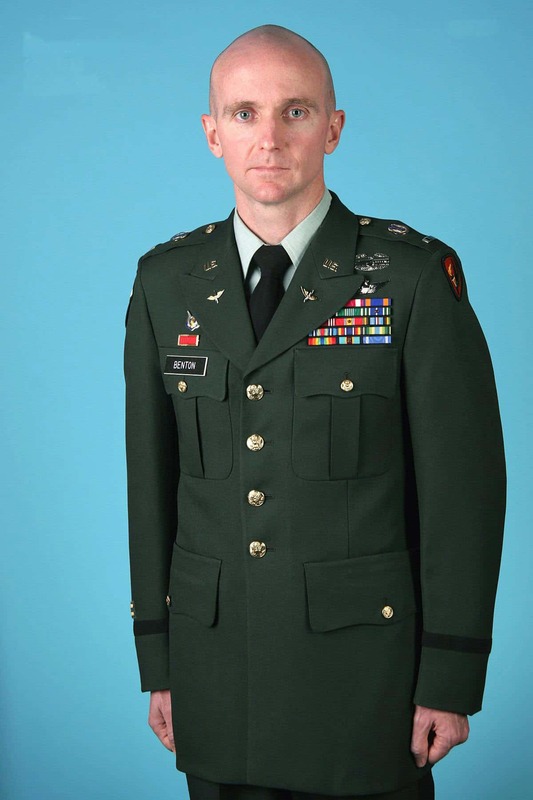 After completing the OH-58D Instructor Pilot course at Fort Rucker in 2001, CW3 Benton was stationed with the 3-17th Cavalry at Fort Drum, New York. He then took the Joint Firepower Control course at Nellis Air Force Base in Nevada before being deployed to Mosul, Iraq with the 3/2nd Stryker Brigade Combat Team in support of Operation Iraqi Freedom. Upon his return from Iraq, CW3 Benton completed the OH-58D Method of Instruction course at Fort Rucker and served in the OH-58D Kiowa Warrior Scout Branch of the Directorate of Evaluation and Standardization. His awards include a Combat Action Badge, Meritorious Service Medal, Air Medal, Army Commendation Medal, Army Achievement Medal, Good Conduct Medal, National Defense Service Medal, Armed Forces Expeditionary Medal, Global War on Terrorism Expeditionary Medal, Global War on Terrorism Service Medal, Armed Forces Service Medal, and NATO Medal. He is also the recipient of the Bronze Order of Saint Michael medal. CW3 Benton holds a Bachelor of Science in Professional Aeronautics with a minor in Aviation Safety from Embry-Riddle Aeronautical University (2003) and is currently pursuing a Master of Aeronautical Science with dual specializations in Education Technology and Aviation Operations from the same institution.